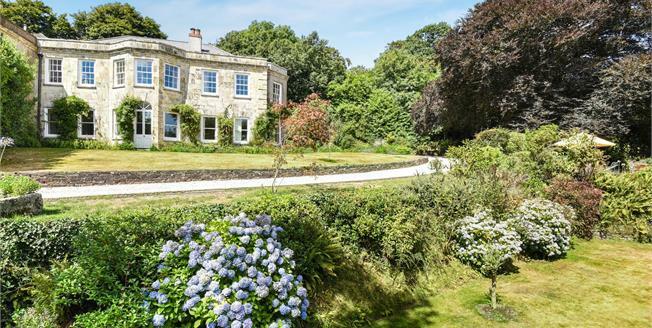 This property is an outstanding Georgian period residence situated within the outskirts of Truro City located in a prestigious rural position yet minutes walk from the town. Formally a large estate, the property is the original house which has been extended over the years and is now divided. It is presented to the market with extensive and private gardens coupled with generous driveway parking and impressive period features. The property is entered into a generous open plan reception hall which provides access to all of the ground floor accommodation. The entrance hallway leads to an inner hall with an impressive returning staircase positioned straight ahead. The formal sitting room is of excellent proportions and provides a number of large windows filling the room with plenty of natural light. There are also French doors which open and lead to the gardens and grounds. There are essentially two parts to the sitting room, the seating area itself with the large open fireplace being the focal point together with a recessed area which the current vendors use as a library area but could also be used for formal dining if required. The impressive kitchen / breakfast room again is of an outstanding size and features a bespoke fitted kitchen with a feature Aga and centralised breakfast bar / island area. Within this room is a large bay window with French doors again providing access to the grounds. To the eastern side of the house is the formal dining room measuring in excess of 20ft in length. This area provides a wonderful space to site a large dining table or could provide a wonderful area if a potential buyer was looking to work from home. This area would almost make a great ground floor bedroom should any buyer have such requirements. Beyond the dining room is a utility room and courtesy door providing access to the rear of the property and parking area. At first floor level there are 5 bedrooms all of which provide generous proportions and views across the surrounding countryside. The two larger bedrooms, one of which the vendors are using as a master together with another large bedroom with en suite facilities, are both in excess of 20 ft. in length. These bedrooms are really quite special and offer such outstanding views, size and layout that they are a credit to the home and the current vendors. All bathroom suites have been renewed in recent years by our clients and are now presented in modern contemporary styles and have been beautifully finished. Externally the property is approached via a long driveway which meanders through the gardens and around to the rear of the property where there are generous parking areas. The majority of the gardens are laid to lawn with mature plant and shrub boarders. In one corner of the property there is a small amount of woodland which is a haven for wildlife. The views on offer from the gardens across the valley are quite exceptional. St Clement is a particularly well regarded riverside hamlet close to Truro and yet is surrounded by beautiful open countryside adjoining the picturesque creeks of Tresillian River being a main tributary to the River Fal. Truro city is only one and a half miles distant. St Clement has a village church and hall, there are many beautiful rural and creekside walks in the area and the village is largely surrounded by farmland. The nearby River Fal and Carrick Roads offer some of the finest protected day sailing waters along the south of England and there are many sailing facilities off the Carrick Roads for the enthusiast. Truro itself is a beautiful city centred around its magnificent Bath Stone Cathedral and picturesque streets that surround it. It’s said to be the finest example of Georgian architecture to the west of Bath. Truro is Cornwall's’ hub for both shopping and business, with numerous good restaurants and bars as well as a fine selection of private and state schooling. The city has a mainline railway station providing a direct service to London Paddington. The north and south Cornwall coasts are both easily accessible from Truro, which combine to enable the most amazing lifestyle opportunities. The following services are available mains electric and water. Private drainage. Telephone line is connected (however we have not verified connection). Combination boiler providing both the hot water and central heating via radiators.